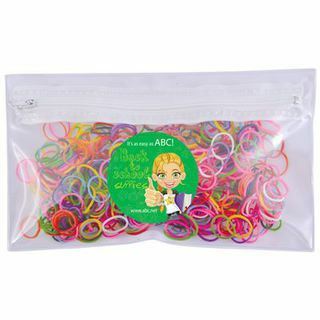 500 synthetic rubber loom bands with 20 sets of ‘s’ and “c” clips packed in clear poly bag, then PVC Organiser with zip closure. PVC Organiser has a clear front and white back. Use to create colourful bracelets, jewellery, pencil toppers, keyrings, flowers, animas, action figures...the possibilities are endless. Get crazy with loom! Loom not included.